A new year is upon us and with it comes new coding, compliance, and reimbursement changes and challenges. Some changes are small and have little to no impact, while others create some level of chaos either with our own processes or for the third-party payers we hope pay us in a timely manner. 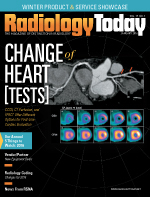 This article provides a high-level overview of the new 2016 CPT® Procedures codes for radiology services. There are many other updates including HCPCS codes, regulatory issues, edits, and more, so it is very important that imaging organizations identify all issues that impact your organization as you cross into 2016. There are fewer coding changes in diagnostic imaging than in interventional services this year, so we will address those in this issue. Next month, we'll feature changes in interventional coding. Some of the biggest changes are in the spinal X-ray codes. The procedure codes for the entire survey study (72010) and the codes typically used for scoliosis (72069 and 72090) have been deleted for 2016. Four new codes for scoliosis exams have been added for one view (72081), two or three views (72082), four or five views (72083), and a minimum of six views (72084). The full definition of these codes: "Radiologic examination, spine, entire thoracic and lumbar, including skull, cervical, and sacral spine if performed (eg, scoliosis evaluation); …" These codes require an exam of the entire thoracic and lumbar spine regions, and they include (but do not require) examination of the skull, cervical spine, and sacral spine if performed. Additionally, the existing code 72080 for thoracolumbar imaging was revised to include a minimum of two views. The 2015 codes for hip X-rays have been deleted (73500 to 73540) and six new codes have been added: three for unilateral (73501 to 73503) and three for bilateral (73521 to 73523). All of these codes include imaging of the pelvis when performed and are assigned strictly based on the number of views taken. Code 73501 represents a single view of the hip, which would previously have been reported with now-deleted code 73500. Code 73502 includes two or three views of the hip with or without pelvis. For example, this code should be assigned for an exam consisting of a single view of the hip and a single view of the pelvis. Code 73520 (deleted for 2016) was formerly used to report a bilateral hip exam consisting of one view of the pelvis and one frog-leg lateral view of each hip. This makes a total of three views, so this study is now reported with code 73522 (bilateral, three to four views). Prior to 2016 there was a specific code for hip X-ray during operative procedure (73530). This service should now be reported with hip X-ray codes 73501 to 73503 when unilateral intraoperative views are taken. Also, prior to 2016 there was also a specific code for X-ray exam of the pelvis and hips in an infant or child (73540). This code has been deleted, and the regular hip X-ray codes should now be used regardless of patient age. The existing femur code 73550 has been deleted and two new codes (73551 and 73552) have been created. A single view X-ray exam of the femur is reported with 73551, and a multiple-view exam is reported with 73552. Two new codes (74712 and 74713) have been created specifically for fetal MRI and are defined by gestation. Code 74712 should be assigned for a single or first gestation and the add-on code 74713 is assigned for each additional gestation. These codes include imaging of the placenta and maternal pelvic organs when performed. The fetal MRI codes cannot be reported together with the codes for MRI of the pelvis (72195 to 72197). Use the MRI pelvis codes instead of the fetal MRI codes when the study is limited to the placenta and/or maternal pelvis without examination of the fetus. The only change in nuclear medicine procedure coding is the revision of the gastric emptying study code 78264 and the addition of two codes for gastric emptying studies. All three codes include the verbiage "solid, liquid, or both," and new codes were created to better reflect the scope and time requirements of the procedure options. Code 78264 is for a regular gastric emptying study. Code 78265 includes small bowel transit, and code 78266 includes small bowel and colon transit over multiple days. Only one gastric emptying study code should be assigned regardless of whether the exam uses solids, liquids, or both, and regardless of whether it is completed on the same day or extends into a second day.